Using a portable TENS unit is a great way of relieving back pain in the comfort of your own home. So find out which is the best one to go for here. If you've ever had physiotherapy treatment for your back pain, then you'll probably have experience of using a TENS unit. TENS (transcutaneous electrical nerve stimulation) ​therapy is the process of providing pain relief by stimulating the nerves of a pain area with electrical impulses. This blocks pain signals in this area from reaching the brain by way of distraction, while also releasing endorphins which are the body's natural painkiller. And this is done through the use of a TENS machine, which delivers electricity to pads (called electrodes) that you place onto your skin close to the pain area. In this way a TENS unit can provide a safe and drug-free way to manage pain, and many people have found this treatment to work well for them. ​Now the one's you see in your physio's office are very large and slightly menacing looking things! However you can buy your own (much smaller and completely unmenacing!) TENS unit for personal use nowadays. And these can be a great help in managing chronic pain. In fact they are no bigger than mobile phones now, and are designed so you can use them on the move. So they are perfect for carrying around with you and keeping you active without any pain. As you can attach the pads under your clothing and clip the TENS unit to your belt, or put it in your pocket. There are even wireless options available that take advantage of bluetooth technology. iReliev Playmakar Wireless TENS Unit. But first let's take a look at how TENS units work, what the benefits of using them are, and if they come with any dangers or side-effects. How Does A TENS Unit Give You Relief From Pain? 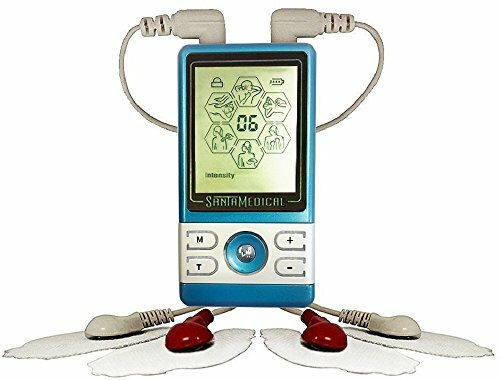 As I mentioned briefly in the introduction, a TENS machine brings relief from pain by blocking pain signals from reaching your brain by electrically stimulating the nerves your pain area. Firstly, the electrical stimulation in the nerves provides an alternative (and competing) sensation for the brain to deal with other than just the pain. ​This alternate sensation can block the pain signals from being transmitted to the brain, meaning there are fewer signals from the source of pain. Secondly, ​the electrical impulses also work to relax your back muscles and increase the release of endorphins into the system. Which is great, because endorphins are a natural painkiller that also work to block pain signals to the brain. Also, some of the more expensive TENS machines are also able to offer electrical muscle stimulation (EMS) therapy. EMS stimulates the muscles rather than the nerves, making them contract which increases the blood flow in the area. This is a great therapy to help sore and stiff muscles heal and recover after strenuous activity, and for this reason it's used widely in the sporting world. However it should be noted that both TENS and EMS therapy can only provide you with temporary relief from pain, they won't fix your underlying problem. TENS units that you buy for personal use are small, lightweight, battery-operated devices that are designed to be used on the move. To use them, you have to connect the leads provided to the device, and then attach self-adhesive electrode pads to the other end. Then you attach these pads to your skin in the area where you are feeling the muscle pain. The TENS machine will then deliver electrical impulses through these pads into your muscles and tissues, which stimulates your nerves and provides a tingling sensation in your muscles. You can adjust the intensity of these impulses so the treatment stays comfortable for you, and also choose how long you want to keep the treatment going for. While the pain relief that comes from using a TENS machine is temporary, many people find that using one regularly is very helpful in managing their chronic pain. Blocking pain signals to the brain means you get a temporary respite from your pain. It relaxes, conditions, and gently massages your sore muscles. You can use it on the move, so it's a great option to keep you active without pain. Using a TENS unit to manage your daily pain can reduce the need for pain medication. The electrical impulses produce endorphins which are the bodies natural painkillers and also improve your mood. Zapping yourself with electric may not be the most appealing thought for some people. And it doesn't sound like a particularly safe thing to be doing. But despite that TENS therapy is thought to be a safe and drug-free method of pain management for most people that carries very few side-effects. Seek medical advice before you use a TENS machine if you have epilepsy or heart problems. Similarly they may not be suitable for people with a pacemaker or metal implants, so consult your doctor for advice. The pads shouldn't be placed over irritated or broken skin. You also shouldn't use the pads on any numb areas. And don't use them on your head or neck either. Some people may be allergic to the pads or gel. If that's the case you can buy special versions that are designed for sensitive skin. If the tingling sensation feels painful when using the TENS unit turn the intensity down. TENS units shouldn't be used when driving or operating heavy machinery. Don't overuse your TENS unit either. Aim for short bursts of pain relief during the day rather than continuous use. Always follow the instructions that come with your specific TENS unit. The amount of TENS units on the market can make choosing one an overwhelming experience. And it can be confusing to work out why some are considerably more expensive than others. The answer to that depends on which features you need your TENS unit to have. The best TENS and EMS combo unit. The best lower priced TENS unit. The best wireless TENS unit. Which will hopefully make the process easier for you. And while the higher end TENS units come with more options and settings, don't be put off by the lower end ones as these can work wonders too. Most of the higher end TENS units will also have EMS functionality, which is a great thing. Because not only can you get pain relief from the TENS, you can also condition your muscles with the EMS to prevent pain from reoccurring in the future. And a great TENS and EMS combo unit that I'd have no hesitation in recommending is the iReliev Rechargeable TENS & EMS Unit. Up to 80 mA of power. Combines two therapies in one device (TENS and EMS). 1 program especially for arthritis and 6 for chronic pain. Two styles of electrode pads (large and small). 2 year warranty and 45 day return period. Very small (5" x 2"). Comes with a belt clip and holster. 14 computer programs mean no need to set up manually. A backlit screen so you can see what you're doing. As this one comes with features that make it especially great for people with chronic back pain. Firstly there are 14 pre-set programs (8 TENS programs and 6 EMS programs) so you can use it straight out of the box. This includes 6 programs designed for chronic pain and 1 specifically to help people with arthritis. And these programs all range in intensity and sensation so you'll be able to find the one that's just right for you. There are also 25 intensity levels, which allows you to adjust the strength and treatment manually too. And you can get great power out of this TENS unit, as it goes up to 80 milliamps of discharge. Which is more than enough no matter how strong you like it! There is a dual channel feature that allows you to work two different areas of the body at different intensities at the same time. And it also comes with both large and small pads that you can use depending on which area you are targeting, making this unit very versatile. Plus it's light, portable and easy to use too, coming with a backlit screen which makes it easy to see what you're doing. And unlike cheaper models it has a rechargeable battery, so you don't have the hassle of constantly buying and replacing AAA batteries with this one. So if you want a TENS and EMS combo unit that can give you relief from pain, massage your muscles, and is perfect to use on the go, then this could be the one for you. When you buy a TENS unit from the lower end of the price range then you are going to have to go without certain features. But that doesn't mean that you can't find good value here. Because you can still find cheaper models that can give you a good hit of TENS therapy and help to ease your aching muscles. And one such example of that is the Santamedical PM-470 TENS Unit. Very small (3" x 1.5"). 6 preset programs means no need to set up manually. As this one does a good job of being a no-nonsense TENS unit but with a couple of extra features over others at this price point. Firstly it has 6 built in programs of various intensity levels to choose from. And you can also adjust the intensity of these programs manually, with 20 intensity levels to choose from. So you'll be able to get it to the right level that feels comfortable for you. Then there is the dual channel feature that allows you to work different parts of the body simultaneously, which is very rare for lower priced TENS units. And it's probably one of the smallest units around, making it easy to carry around with you. Throw in the rechargeable battery and this TENS unit is a real bargain. While most TENS units are small and portable nowadays, there is still one problem that can make them a bit cumbersome to use. And that is all the wires. Because you'll have to attach each of the 4-8 electrode pads to the TENS device with wires. So it can feel a little uncomfortable if you're using one when walking around. However a good solution to this is to pay a little extra and get yourself a wireless TENS unit instead. And a great example of one of these is the iReliev Wireless TENS Unit. Two wireless pods to attach to electrode pads. Very small (6" x 2"). No wires is a godsend! Rechargeable battery on TENS unit and wireless pods. This one is almost identical to the iReliev TENS & EMS combo unit that we recommended earlier, but with one big difference. Instead it comes with two wireless pods that you attach to electrode pads that you place on your pain areas. And you can operate these pods from your device via bluetooth. You can even add extra pods if you want to serve more areas at the same time. As this unit has quad channels so you can set each pod to different intensities and programs in 4 different areas if you want to. And it still has the same 14 preset programs, and 25 intensity levels of the iReliev wired TENS & EMS unit. So all in all it's a great TENS unit and the best option if you want one you can use comfortably to get pain relief on the move. Check out the video below to see what it's all about. Do TENS Units Actually Work? I thought I'd end with a question that may still be on your lips. Because while TENS units have been a great help for many people in managing their pain, others have failed to experience the benefits. Well it seems a lot of it is down to individual experience, as the scientific evidence hasn't been that great up to now. And also that it is better for improving pain and sensitivity in muscle knots than physical muscle stimulation. However the majority of these studies have been inconclusive. Leading some to suggest that TENS therapy may be little more than a placebo effect. ​But while this lack of scientific evidence is a worry, the widespread use of TENS units in medical facilities and the relief that many people have experienced from using them makes them worth a try in my book. And as there are no real side-effects if you follow the guidelines, you have nothing to lose and everything to gain by giving one a go. Johnson, M., & Martinson, M. (2007). Efficacy of electrical nerve stimulation for chronic musculoskeletal pain: a meta-analysis of randomized controlled trials. Hsueh, T. C., Cheng, P. T., Kuan, T. S., & Hong, C. Z. (1997). THE IMMEDIATE EFFECTIVENESS OF ELECTRICAL NERVE STIMULATION AND ELECTRICAL MUSCLE STIMULATION ON MYOFASCIAL TRIGGER POINTS1.